Horseweed (Conyza Canadensis), hairy fleabane (Conyza bonariensis), and junglerice (Echinochloa colona) are problematic weeds in the perennial cropping systems of California. This problem has been growing due to populations that have become resistant to the commonly used herbicide glyphosate and glyp hosate + paraquat. Two alternative herbicides have been identified in perennial cropping systems: sethoxydim and glufosinate. Like the problematic weeds, the performance of the herbicides sethoxydim and glufosinate can be influenced by environmental conditions such as light intensity and soil moisture. 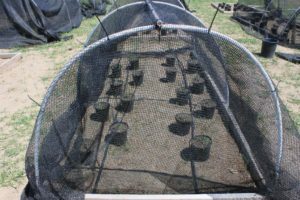 Phase one of this project, conducted by Anil Shrestha, evaluated plants grown under three levels of light intensity (to measure the effect of shade) and three soil-moisture level. Regimes were treated with label rate s of herbicides along with untreated control plots. 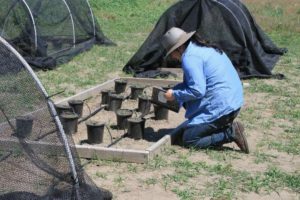 In phase two of the project, three students from California State University, Fresno are now working on a supplementary study to address issues found in phase one of the project. The students will be doing additional measurements of soil moisture levels as well as seed production by surviving plants. The anticipated outcome is that the environmental conditions for the success of these alternative herbicides on these problematic weeds will be identified. The project will provide valuable information for management of this weed species in perennial cropping systems of the Central Valley and be a part of ongoing state-level efforts to manage glyphosate-resistant (GR) weeds in California. Sorghum as an Alternative Crop?